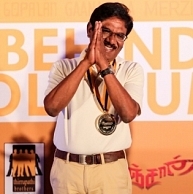 At the Behindwoods Gold Summit, legendary director, Bharathiraja was presented with a Gold Medal for Best Acting Performance for his role in Pandiya Nadu. During his acceptance he started off with his trademark opening line - “En Iniya Tamizh Makkalae” and had a few anecdotes to share. “I had come to Chennai a long time back to act, but the audience accepted me in another line. I feel funny acting, but I’m happy that I have been accepted for my acting skills in front of the camera as well. I’m proud that after four generations I am sharing the dais with Sivakarthikeyan, Dhanush and Anirudh. There is a myth that people portray me as a tough man, and that I treat my actors badly. That’s the reason I take new actors for my films. At this point I would like to thank Suseenthiran for putting up with this ‘Toughie’, having the confidence in me, giving me the role of a subtle middle class person”. People looking for online information on Behindwoods Gold Medals 2013, Bharathiraja, BWGoldMedals will find this news story useful.